Oltrepò Pavese is an acclaimed viticultural area and producer of top still and sparkling wines just south of the Po River in the region of Lombardy. Its hills — ideal for fine wine production — lie at the foot of the Apennine mountains and its subsoils are characterized primarily by pebbles, sandstone, and clay, also ideal for the cultivation of fine wine grapes. Frecciarossa is one of Oltrepò Pavese’s historic estates and can trace its roots back to the 18th century. The villa that stands on the property today was first built in the 19th century but it wasn’t until the late 1980s that the Odero family began to shift its focus to the production of fine wines. By the 2000s, the winery became a regular winner of the prestigious Three Glass award from the Gambero Rosso (the publication’s top honor). 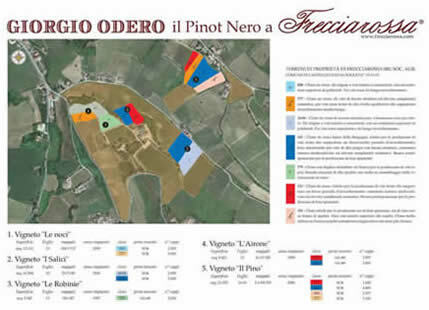 The following description of the estate and its growing practices have been translated and adapted from the original Italian (by Vignaioli Selections). Check out the English-language version of the winery’s website here. Currently, the Frecciarossa estate covers nearly 25 hectares of which 20 are planted to vine. An additional 6 hectares have been replanted to vine but are not yet being used for the production of wine. Grape varieties are as follows: Riesling Renano (Rhine Riesling), Pinot Nero, Coratina, Barbera, Uva Rara, and Merlot. Simple Guyot training is used for all grape varieties. Farming practices are aimed at finding the right balance of vigor and yield in the vineyards. For this reason, the plants are never “forced” using powerful fertilizers. Instead, the owners use organic compost to give the vines the nutrients they need. Wild grasses grow between the rows in order to create competition with the root system of the vines. The vines are planted at high density per hectare, spur pruning is employed, and carefully selected fruit is dropped in order to reduce vigor and enhance the quality of the fruit to the greatest degree possible. This is the best way to obtain grapes with the desired characteristics that will most greatly express the terroir where they are grown.